Stuff Points: Earn 39 points when you buy this stuff. Save money when you order these two products together. Each one of these can be purchased separately, but if you want both, this combo is the way to go. We offer this package so that anyone that wants to order both items at the same time can pay a lower price. 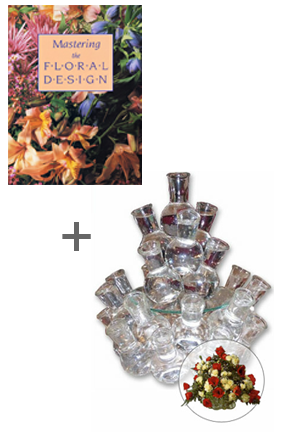 Mastering The Floral Design is the perfect book to accompany the Floral Design System. It offers step by step instruction, and detailed pictures to show you all of the arrangements you can make using this great tool. The Floral Design is already the easiest way to produce professional looking floral arrangements every time, but this book makes it even easier. There is no talent or skill necessary when using these products, and they will ensure that your fresh or dried flowers are perfectly arranged into a beautiful looking bouquet. Order Your Combo Today! Floral Design Flower Arranging Tool - Save money and look like a pro. The easiest way to arrange flowers. An elegant addition to any home or office. Use fresh or dried flowers to create a great floral accent. Order Yours Today! It was worth the wait. I knew the Floral Design Combo vase was going to be great because I actually gave one as a gift and then had to have one of my own. Such a unique item and quite the showstopper. What made it even better was the ordering process was so easy... will certainly be back for more items!